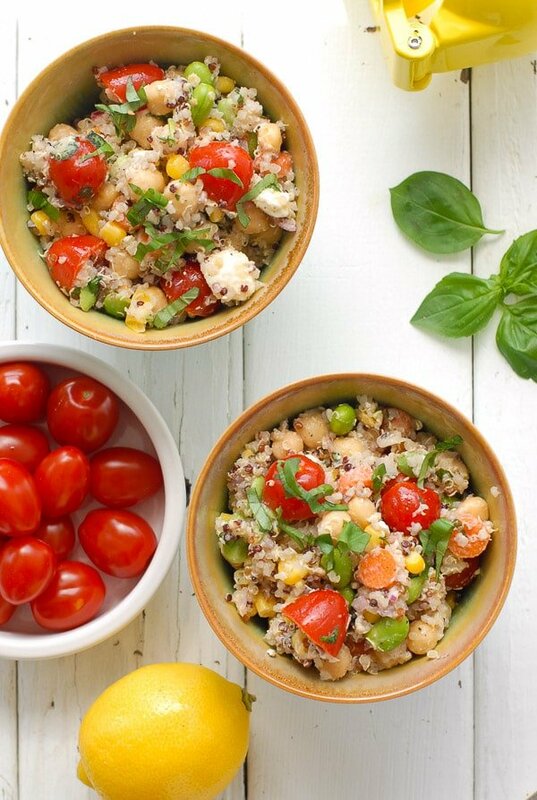 Rainbow Quinoa Summer Salad is bursting with vibrant color and summer flavors. 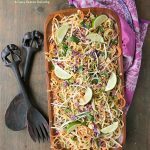 Packed with plant protein and done in less than 30 minutes, it is a great side dish for grilled proteins, picnicking or a quick, light dish anytime! I love color in my food. I am always excited when presented with colorful, textured food versus food with a ho-hum chromatic appearance. I’m sure you’ve heard about ‘eating the rainbow’; a school of thought which believes the more varied color in one’s diet, the better the overall nutritional value due to the different nutrients in the spectrum of colored foods. Summer is such an easy time to include lots of color and robust flavors in food. And why should you have to choose between them? 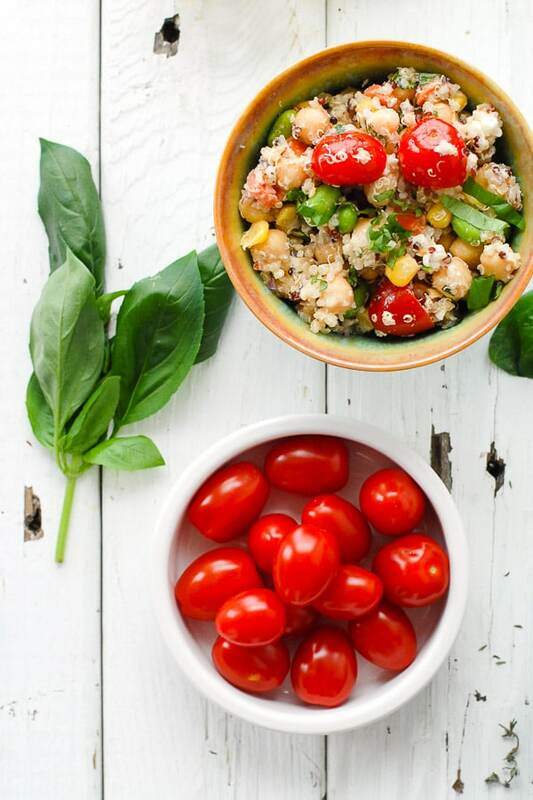 This delicious Rainbow Quinoa Summer Salad really includes some of summer’s favorties: vine-ripened cherry tomatoes, fresh corn, basil and more. Everywhere you turn these days you’ll find quinoa (keen-wah), a South American grain which is lightly flavored, a complete protein with a great texture. 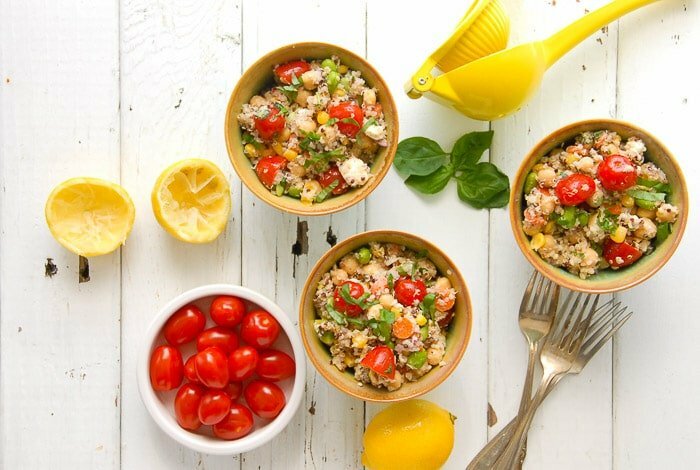 It’s similar in texture to bulgur wheat you may have tried in Tabouleh salad. 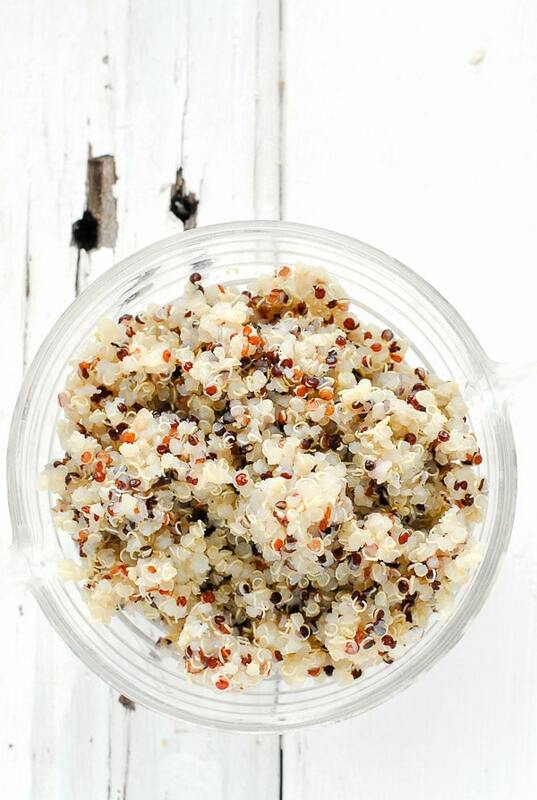 Quinoa is a perfect grain for gluten-free diners especially as a substitute for bulgur. 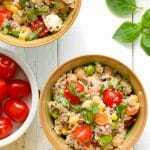 Quinoa cooks in 20 minutes and is available in three colors (red, black and white) offering an easy side dish for dinners on the run, which is also light and nourishing. 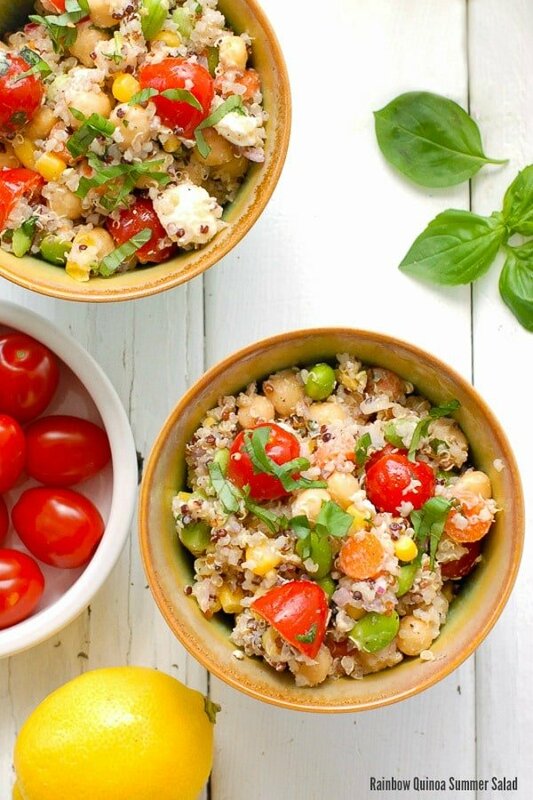 For this salad I used Rainbow Quinoa which is a mix of all three colors and is available in most grocery stores (if not, any of the colors may be used on their own). Before its cooked, quinoa is a miniature granule and after it cooks is presents its signature white ‘germ’ which looks a bit like a tail. Another ingredient I love is edamame (soybeans). Ten years ago the only place you may have encountered them would be if going out for Japanese food where the they are a standard appetizer, cooked and served in their pod for diners to squeeze into their mouths. Now they have become a star ingredient, being packed with protein and great nutrition in the most gorgeous shade of lime green and are widely available in most grocery stores (check the frozen section). Tossing quinoa and edamame into a chilled salad with seasonal vegetables and herbs, some salty Feta cheese, and freshly squeezed lemon juice seemed a perfect, light (and quick) partner to outdoor grilling. It can be prepared in less than an hour (with the bulk of the time being comprised of ingredient chilling). 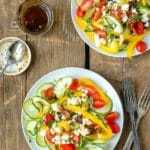 The colorful visual of this salad, paired with fantastic textures, begs to be gobbled up by vegetable lovers and will enchant those who are more vegetable averse as well with its sunny appearance! This colorful, full-of-summer-flavor salad is a sure win for the hot weather season. Served chilled is becomes the perfect partner for grilled foods, picnics and outings. Packed with protein too! 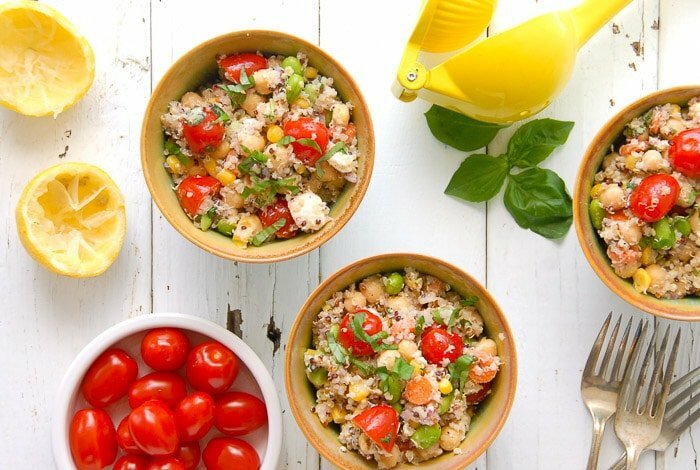 In a large bowl or if storing before serving a container with lid, combine the all ingredients except the lemon juice, olive oil, rice vinegar, and salt and pepper. Stir to fully combine the ingredients. In a small bowl combine the lemon juice, olive oil, and rice vinegar. Pour over the salad and stir well to fully combine. Add salt and pepper to taste. Chill in the refrigerator, in a closed container until serving. *corn kernels and edamame may be cooked together and chilled in the same container. 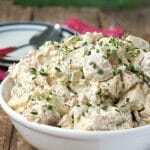 This delicious recipe was originally published in May 2013 and has been updated in 2016. Soybeans being used here is a nice catchy idea for my tastes. I can go everywhere and any time for a salad like this! I like the many benefits of quinoa but I am still having a hard time finding it in our place. Oh, I haven’t tried quinoa. I wish I can find something here in our place.